Professor Thomas M. Fürst has been providing a combination of architectural and design services to his clients since 1964. Thomas M. Fürst was born in Düsseldorf in 1942. He studied at Aachen University from 1963 to 1967 (a contemporary of such leading names as Steinbach, Mehnert, Bart and Bartels) and during his studies acquired initial professional experience at the Cologne office of the architect Professor Gottfried Böhm, winner of the Pritzker Prize, architecture’s “Nobel Prize”. Since 1980, Thomas M. Fürst has been Chairman of the Düsseldorf-based AIV (Association of Architects and Engineers). After 38 successful years with the architects’ practice HPP Hentrich-Petschnigg & Partner KG in Düsseldorf, in 2006 he founded his own company, Fürst Architects GmbH. 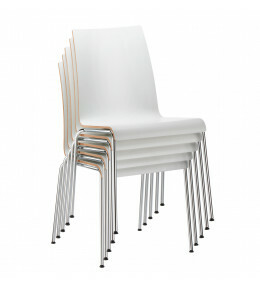 Prime Breakout Seating range is available as a barstool with footrest or chair with writing tablet.